League One's top marksman made it 28 goals for the season with his fifth brace of the campaign, but missed a glorious chance to claim the match-ball by firing wide when through on goal in the final minute. The 22-year-old, released from Partick in the summer, has enjoyed a breakthrough season at Stark's Park and still hopes to cap it off with a treble in the remaining weeks. "I just can't seem to get this hat-trick," he said. "I've been trying all season and it's a bit frustrating. "I just need to go and try get one next week in the Fife derby. "After today's performance we'll got into that game with a lot of confidence." 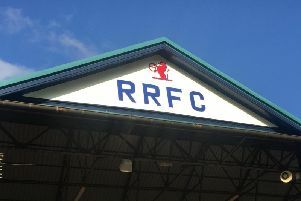 The victory saw Rovers reclaim second place following the defeat at Forfar the previous Saturday. "It was a good win, especially after last week which was very disappointing," Nisbet admitted. "It's been a stop-start season for us but hopefully now we can string a few more wins together betweeen now and the end of the season and go up the hard way." Rovers boss John McGlynn was full of praise for the performance of Nisbet, who also claimed the fans' app man of the match award. "His work-rate throughout the whole game, he was a handful," he said. "He's a big, strong boy and when he puts himself about like that he creates a big problem for defenders because he's got a great first touch and great awareness. "I thought he was excellent, but we didn't have a failure, everyone played their part."